Last week was a big week for Exchange. 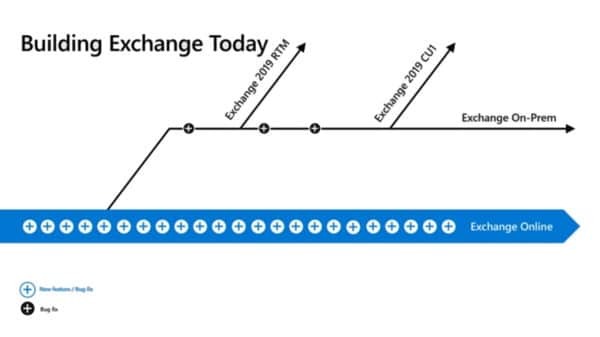 Microsoft released its first cumulative update for Exchange 2019 as well as cumulative updates for Exchange 2016 and 2013. Here is a quick reminder that extended support for Exchange 2010 is coming to an end. After January 14th, 2020, no further technical support or updates will be available. This includes security, bug and time zone updates. Unfortunately, there is no direct path to Exchange 2019 from 2010. If you do plan to stay on-prem you will need to migrate to either 2013 or 2016 (I’d recommend 2016 as 2013 is now in extended support). From there you can migrate to 2019. Alternatively, you can migrate to Office 365. For more information about the Exchange 2010 life-cycle check out the Exchange Team blog. Push notifications are one type of notification a developer can leverage in their application to add value. An example of a push notification might be the notification of new mail on a mobile device. In this series of cumulative updates, the Exchange Team has changed the way it initiates push notifications through Exchange Web Services. This is in direct response to a security flaw where an attacker could intercept push notifications to gain access to credentials streamed via NTLM. These cumulative updates mitigate this attack by removing these credentials from the stream. Microsoft documents this resolution in KB4490060. After applying this cumulative update, Microsoft recommends forcing the computer account to change its password by using either the Reset-ComputerMachinePassword cmdlet or, NETDOM. In addition, Microsoft recommends every organization review its user password expiration policies. In further response to the security flaw, Microsoft is reducing the number of rights Exchange has in Active Directory when operating in a shared permission model. In a shared permission model, Exchange administrators have the ability to create security principals in Active Directory and mail-enable those security principals. This includes the ability to create a new user as you are creating a mailbox, or, the ability to remove a user when you remove a mailbox. This also extends to tasks such as being able to create a distribution group, or, modify distribution group members. In a split permission model, the Exchange administrator is restricted from these tasks and can only mail-enable, or, mail-disable existing objects (e.g. users, groups or contacts) that were created by an administrator with Active Directory rights. Going forward the shared permission model will have fewer Active Directory rights, but that does not mean reduced functionality for Exchange administrators. It’s amazing to believe that Microsoft Ignite was over a month ago. With 1,610 sessions Microsoft gave us a massive amount of announcements and demonstrations of new product features. This included Exchange 2019. If not already, I highly recommend checking out 15 Ignite sessions every Exchange admin should see. Each session in this article includes extensive notes on what each session contained. In addition, those notes contain timers so you can jump to the section that interests you the most. Hopefully, it will also serve as a reference if you need to search for a certain announcement or feature weeks (or even months) down the road. Here is what Ignite taught us about Exchange 2019. The tagline for Exchange 2016 was that it was “forged in the cloud”. This was a result of Exchange Online and Exchange on-prem sharing a common code base. The greatest benefit of this common code was that it ran in the cloud for a number of months before shipping on-prem as a cumulative update. By the time the code was released on-prem, it had been more than validated as stable and able to run at scale. Going forward Microsoft has separated Exchange on-prem into its own code branch. This means that Exchange online is no longer driving cumulative updates for on-prem. What will drive updates are security patches and feature requests from customers. So, be sure to make your voice heard on UserVoice, at conferences, and in the various TAP programs. While Microsoft currently plans to keep cumulative updates quarterly, they have opened up the conversation on whether updates should occur less frequently. Common feedback is that the current release cadence of quarterly cumulative updates is too aggressive for some customers. The product group also believes this could result in more stable releases. Last week was a big week for Exchange 2016. Microsoft released Cumulative Update 11. At this time no updates were released for Exchange 2013 or Exchange 2010. Exchange 2013 entered extended support back on April 10th, and Microsoft announced in June that cumulative update 21 was the last planned update for Exchange 2013. Cumulative Update 11 now officially supports .NET Framework 4.7.2. Framework 4.7.2 is only optional at this point and will not become mandatory until the June 2019 updates. Due to no quarterly update scheduled for December, it is expected that CU13 will be the first version to enforce 4.7.2 as a requirement. Support for 4.7.2 has been officially added to Exchange 2013 CU21, which was released back in June. 4.7.2 will also be a requirement for Exchange 2019. However, 4.7.2 is preinstalled with Windows Server 2019, so it will not require a separate download. For a great resource on navigating which .NET update goes with which CU I recommend reading Upgrade Paths for CU’s & .NET by Michel de Rooij. Cumulative Update 11 will now perform prerequisite checks to confirm the necessary versions of Visual C++ are installed. These updates contain 22 security and bug fixes. Check KB 4134118 for a list of issues CU11 resolves. 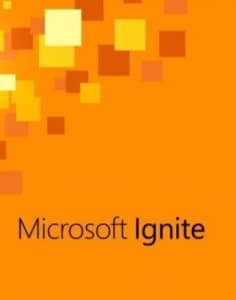 Microsoft hosted its annual Ignite conference in Orlando this September. Ignite was massive at 1,610 sessions. That is a lot of sessions! For the first time ever, Microsoft live streamed most of its sessions. Not just the keynotes! You can find the on-demand sessions at the Microsoft Tech Community. Here are the top 15 sessions I think every Exchange admin should watch. In this session, Greg Taylor and Brent Alinger discuss all the new features shipping in Exchange 2019. They also discuss features that have been discontinued and the system requirements for Exchange 2019. Note: Due to the discontinuation of Session Border Controllers, 3rd party PBX systems cannot use Cloud Voice Mail. Microsoft recommends server core for improved performance, smaller attack surface & smaller disk footprint. 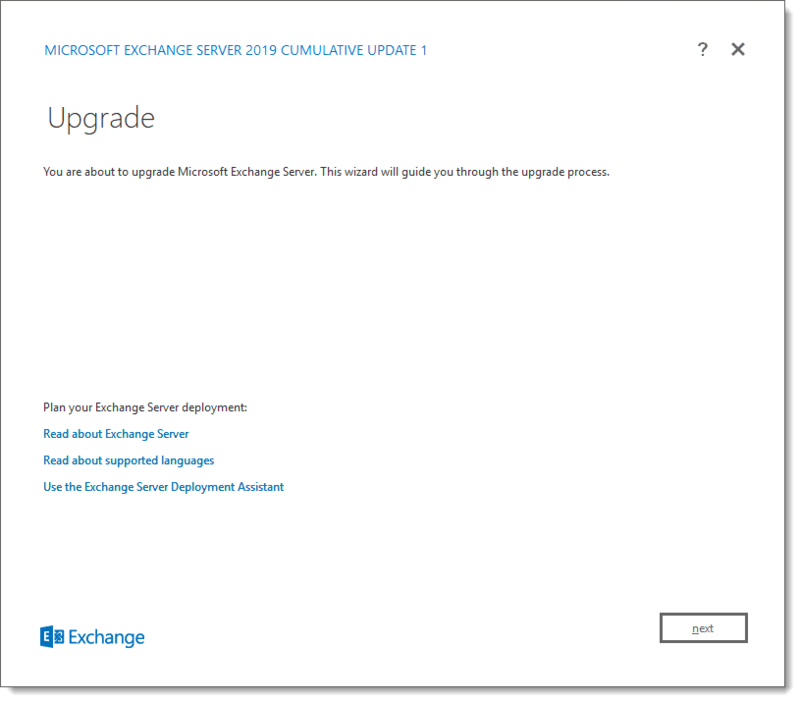 Exchange 2019 can still be installed on an OS with a GUI. Exchange administrators can cancel meetings (not appointments). Do Not Forward can now be set on meetings created in OWA. Meeting attendees in OWA will see a banner stating Do Not Forward is enabled & Forward option is greyed out in the menu. Rollback_OCT script available in the logging folder. Can we control the updating of the Hybrid Agent? Can we have a PowerShell version of the OCT? What is the scalability of the Hybrid Agent? Can RBAC be integrated into OCT & Hybrid Agent? How can I get rid of Exchange on-prem? Would the Hybrid Agent eliminate the need to keep Office 365 URLs & IPs up to date on our firewall? Does the Hybrid Agent support multi-forest? How does the Hybrid Agent work with organizational sharing of free/busy? When is the Hybrid Agent expected to GA? Do I still need a 3rd-party SSL cert for on-prem Exchange servers in hybrid? Will there be a path from classic to modern hybrid? Will the hybrid agent support multiple geographically dispersed migration endpoints? Are there any advantages to sticking with the classic hybrid? Is the private preview of the Hybrid Agent fully supported? Does the Hybrid Agent remove the requirement to publish Autodiscover on-prem? Will hybrid Send As work in multi-forest? Will hybrid Send As be available in the classic hybrid? Does the Hybrid Agent eliminate all DNS changes I need to make to go to Office 365? Apply protection (encryption, restriction, watermarks), governance (retention, deletion, archiving), and monitoring (alerts). Last week Microsoft announced the public preview of Exchange 2019. It is expected that Exchange 2019 will ship later this year. You can download the preview bits using the link below. Please note, that this is preview code and you should not deploy this in production. The biggest announcement is that Exchange 2019 is the first version of Exchange to work on Windows Server Core. The benefit of Server Core is added security. Server core reduces your attack footprint and a smaller footprint means fewer things to secure and keep up to date. It’s worth noting that from an administrative standpoint Server Core is a bit of a different animal. If you access Server Core via a console or remote session you are only going to see a command line. You will quickly notice that programs which use an MMC, such as Services or Event Viewer, are unavailable. In addition, shell programs such as Windows Explorer, or, Task Manager are also unavailable. For Exchange, this is not much of an issue because the Exchange Admin Center and Exchange Management Shell can be run remotely from anywhere. For everything else, you will need to use Remote Server Administration Tools or remote PowerShell. For a list of tools that are directly accessible on Server Core check out the article: What is the Server Core installation option in Windows Server? 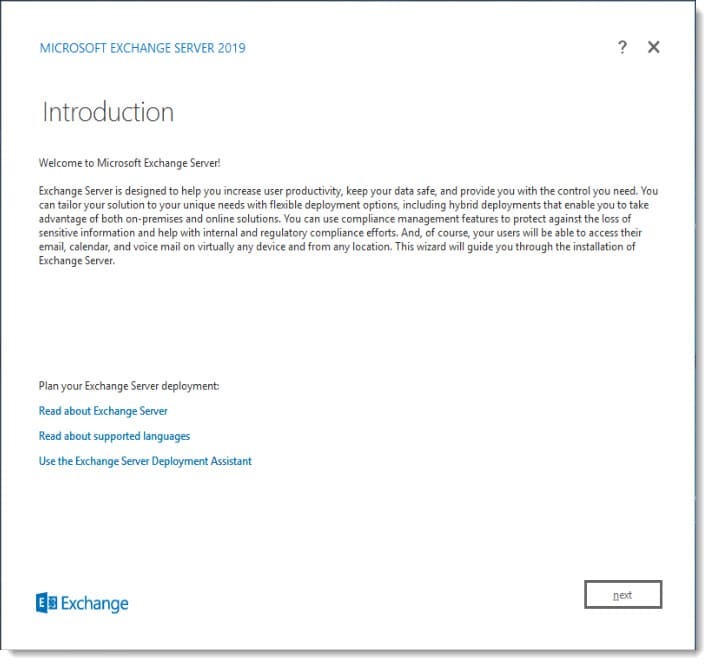 For a great write-up on installing Exchange 2019 on Windows Server Core, check out this article from the Exchange Team. Today was a big day for Exchange updates. Not only did we get Cumulative Update 10 for Exchange 2016, but we also got Cumulative Update 21 for Exchange 2013. Exchange 2010 also receives a critical update in rollup 22. In case you missed it Exchange 2013 entered into extended support on April 10th. Cumulative Update 21 is the last planned update for Exchange 2013 and no further product development is expected. Any cumulative update after 21 is at Microsoft’s discretion. However, security and timezone updates will continue to be available until April 11th, 2023, delivered primarily through the Windows Update Catalog. As a reminder, Exchange 2010 has less than 18 months of extended support remaining. After January 10th 2020, no further technical support or updates will be available. This includes security, bug and time zone updates. If you are still on 2010, I would recommend planning a migration to Exchange 2016 or Office 365 as soon as possible. One prerequisite change is the need to install Visual C++ 2013. This is required for a third party software component–that manages WebReady document viewing and data loss prevention–which ships in these updates. Visual C++ 2012 was the previous requirement for older cumulative updates. However, Visual C++ 2012 was installed automatically by the Unified Communication Management Agent (another Exchange prerequisite), so it never required administrator intervention. This means Visual C++ 2013 will also be a requirement for new server installations. Exchange 2010 received a significant update in this release, which is the ability to leverage Windows 2016 domain controllers and global catalog servers. While 2016 DCs could exist in an Exchange 2010 environment, Exchange 2010 would simply not use them. With this update, 2010 will now leverage 2016 domain controllers and allow for the domain and forest functional levels to be raised to Windows Server 2016. This will allow you to eliminate all older domain controllers. On May 4th I had the great pleasure of being a guest on the RunAs Radio podcast. I joined host Richard Campbell to discuss the latest in Exchange and Office 365. We also discuss the deciding factors and roadblocks companies face when exploring the cloud. It was great to be back on Richard’s show. We couldn’t believe our last recording together was one and a half years ago. Boy–time flies! On March 24th I had the great pleasure of being a guest on #MVPBuzzChat. I joined host Christian Buckley to discuss data residency, hybrid modern authentication and new products shipping in 2018. We also discussed the importance of TAP, Windows Insider program and participating in UserVoice.